I have two things I want to share with you today. My beautiful, talented, inspiring, and amazing friend Nycia and I had a conversation about two years ago and TODAY it's finally happening. She talked and talked, and dreamed and hoped to one day start a blog called, "She Inspires" in hopes to bring new and fresh content, give readers a daily dose of beautiful inspiration, creativity, and style. She wanted a positive place for women to come and simply, get inspired! :) When she said that name...I thought, "GIRL! That is GOLD!" I mean, how awesome is that title "SHE INSPIRES!?" Especially being in the blogging community where we are here to love on one another, gain wisdom, advice, relate to one another, and most of all...INSPIRE! It was perfect. Now I know how cliche' and easy it is to sit here and say, "Go check out my awesome friend's blog!" I mean, duhhh we all do it! BUT, I am honestly sitting here right now with a heart full of love, appreciation, compassion, and pure admiration for my friend. She has a spirit bigger than the Sun, an infectious personality, a smile that lights up a room, and a golden heart that radiates JOY in everything she does. She's been uplifting and encouraging on my best days, and especially on my worst days. I can always count on her y'all and for that I am forever, everrrr thankful. I don't think I can put into words how much her friendship REALLY means to me. She pushes me day in and day out to be a better woman of God. She celebrates with me, she cries with me, she gets excited with me, she prays with me and for me, and guess what? She does this for everyone in her life. The encouragement and heart this lady has to offer is unreal and I am so glad that she's putting herself out there. She's a gem in every single aspect of her life. GOSH, I'm starting to sound like a broken record and seriously, I could write for days about how much I love this woman...but I hope that just goes to show you how truly incredible she is. I can only imagine if she puts half as much heart into this blog as she does her friendships that you will quickly see what I am talking about. I consider myself blessed, and forever thankful that I can call her one of my very best friends. Please, please go check out her new venture you guys. I promise you won't regret it. You know those things that you say you want to do? Those things you say, "One day I want to do this..." Well, this is her "One Day" and she is starting something that she is so passionate about. Wouldn't you love for someone to encourage your dreams? I am so proud of her for finally going for it, and I am so honored that I can even be a small part of She Inspires. I will be a contributor for She Inspires and you bet your pretty little faces that it will be gooooood. I am so over-the-moon happy for her y'all... it's going to be so great! And HEY! You gotta start somewhere right??? She Inspires is going to be a place for women to inspire one another. It will be a positive experience...and most of all, a REAL experience. We want to share our hearts, and stories. You know those things that happen behind the scenes that we don't talk about? You know... those "learning experiences" that we all face in blog world and business world? Yes. We want to address all of those things that will help you be a better businesswoman. A better friend. A better wife. A better mom. A better partner. A better woman. A better YOU! We will learn together. Love together. And naturally, INSPIRE together. We would love to hear from you! Feel free to contact us at hello@sheinspires.com with any questions or if you just want to just say HELLO! If you have a fabulous home, cute DIY, a lovely wedding, or a fun party and would like to share with our readers, email us with "Submission" in the subject line. Tell us what you would like to share on She Inspires, and we will contact you within 48 hours with details. If you know of a woman that inspires you and would be a perfect feature on She Inspires, email us with "Inspiring Woman" in the subject. We are looking to share stories of successful women, that Shine Out Loud on a daily. Please let us know if you are interested in becoming a sponsor or would like to advertise with us. We would love to get our media info to you. Drew shared this commercial with me the other day, and I literally couldn't wait for Wednesday to get here so I could post this. I'm sure most of you have seen it but it makes me laugh every single time. I LOVE SHE INSPIRES!! It makes me so happy!! I LOVE YOU! You make me so happy!!! :) Thank you for being excited Kait!!! Means so much! So exciting! :) Going to check it out now! awwww, Shay. What a sweet, sweet, sweet write up!! Nycia is the best and is such a blessing. Here's to She Inspires!!! Oh and the commercial made my day! so exciting! just checked it out and can tell i am going to love it. Can't wait to check out She Inspires...also, thanks for the great commercial. I'm dying laughing! Ahaha I don't think we get that commercial in Canada so thankyou for posting - SO good! Shay this is such a neat & wonderful site! Congratulations to Nycia on making her dream a reality! 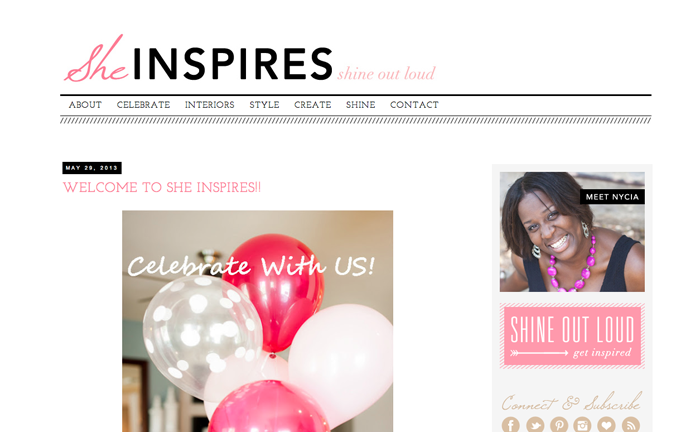 I will be adding She Inspires to my blog roll! It's nice to have a space that is nothing but inspiring & uplifting women in every way - we need more of that in this world! Hahaha, how funny is that hump day commercial? !